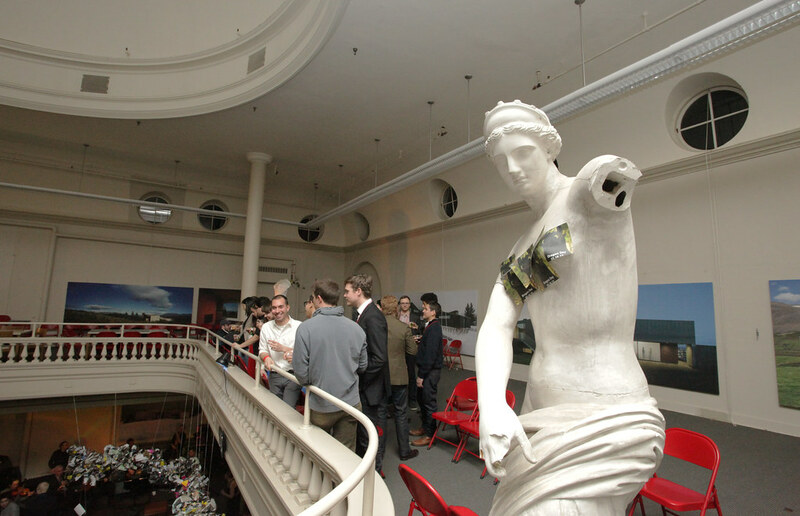 Alumni attend a first-year architecture review on the third floor of Sibley Hall on Friday. 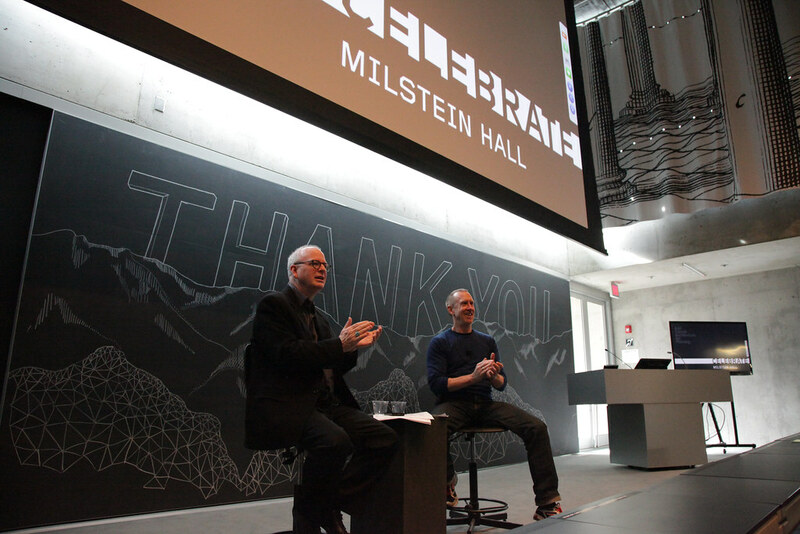 Kent Kleinman, AAP dean, with OMA founding architect Rem Koolhaas in the Abby and Howard Milstein Auditorium. 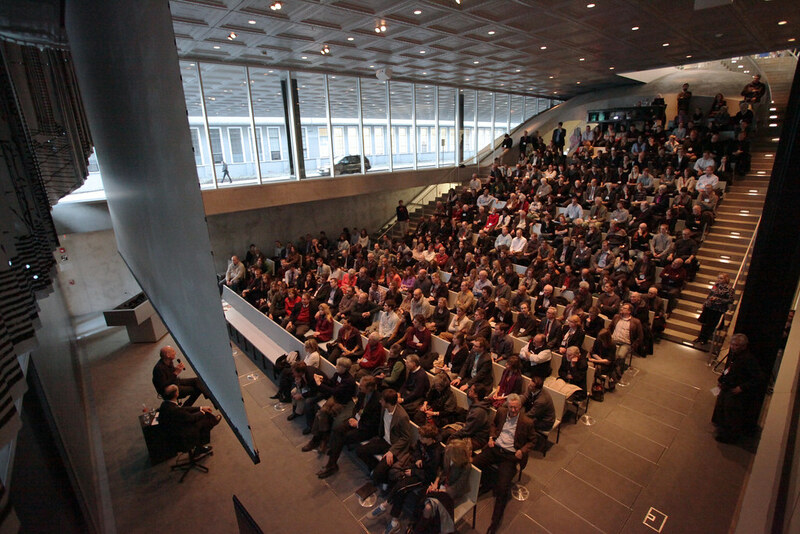 Howard Milstein and guest attend the Rem Koolhaas lecture in the Abby and Howard Milstein Auditorium. Alumna Frances Shloss (B.Arch. '45) shares her sketch of the auditorium. 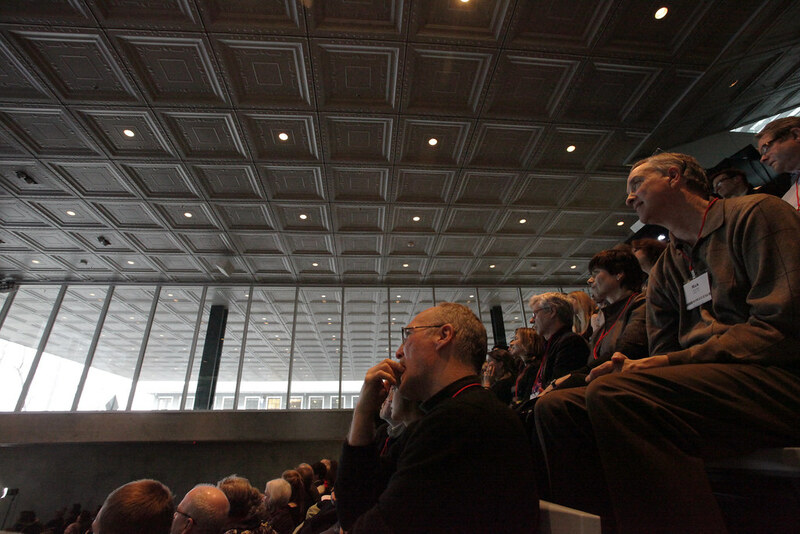 Alumni enjoying the Rem Koolhaas lecture in the Abby and Howard Milstein Auditorium. The view shows the auditorium ceiling and University Avenue cantilever. Rem Koolhaas lecturing in the Abby and Howard Milstein Auditorium. 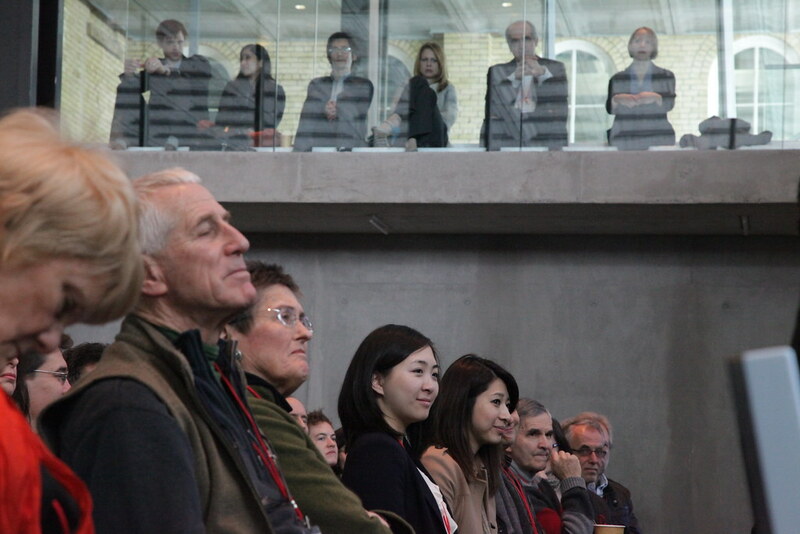 College Alumni and Advisory Council members are part of the capacity crowd at the Rem Koolhaas lecture. 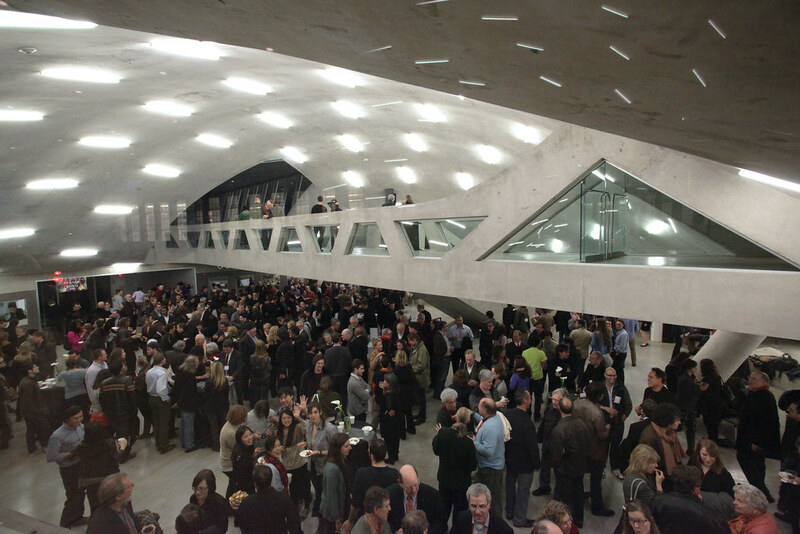 The Stepped Auditorium was used as an additional seating location for students and alumni to watch the Rem Koolhaas lecture. The view from the Abby and Howard Milstein Auditorium balcony showing Dean Kent Kleinman in conversation with Rem Koolhaas. Architecture freshman selling Dragon day t-shirts in Milstein Hall studio. A view of the Friday evening reception from University Avenue eyebrow window. AAP alumna Ellen Bildsten (B.Arch. 88') on the far right, with daughters Mariel and Kate. Ellen's father and architecture alumnus Earnest Pospischil and his wife Maria. View of the Milstein Hall bridge from University Avenue. AAP Advisory Council member and alumna Jill Lerner with alumni and students at the Friday evening reception in the Milstein Hall dome. 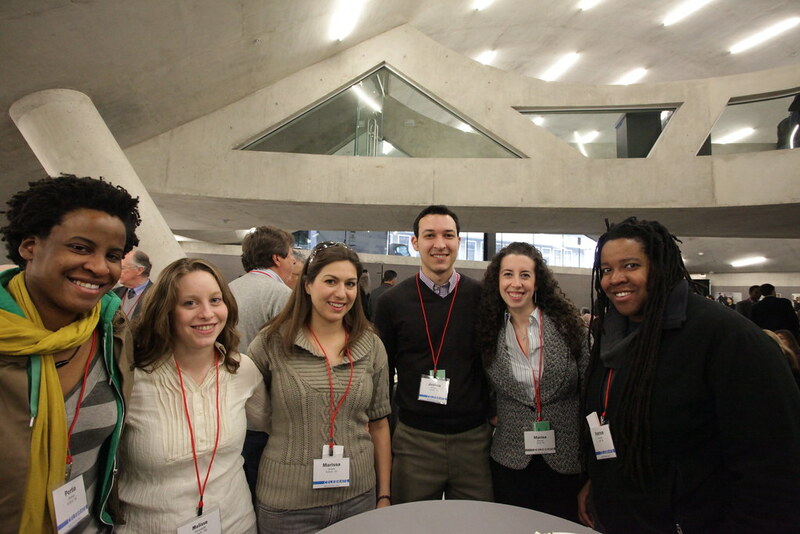 Alumni exploring Milstein Hall during the Friday evening reception. Alumni enjoying the Friday evening reception under the Milstein Hall dome. 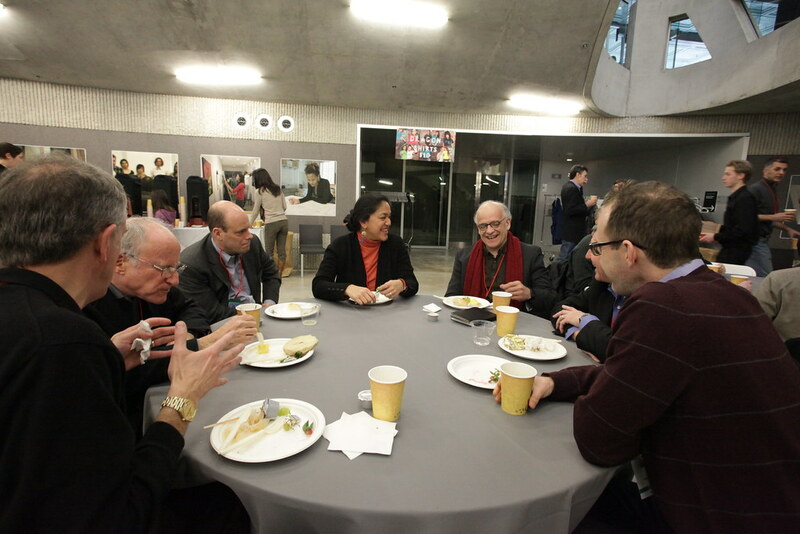 College alumni and faculty enjoy a Saturday morning breakfast with faculty. A view from under the Milstein Hall bridge at the Saturday morning breakfast with faculty. Alumni enjoying the Saturday morning breakfast with faculty. Department of Art faculty member Greg Page talking with an alumna at the faculty breakfast. 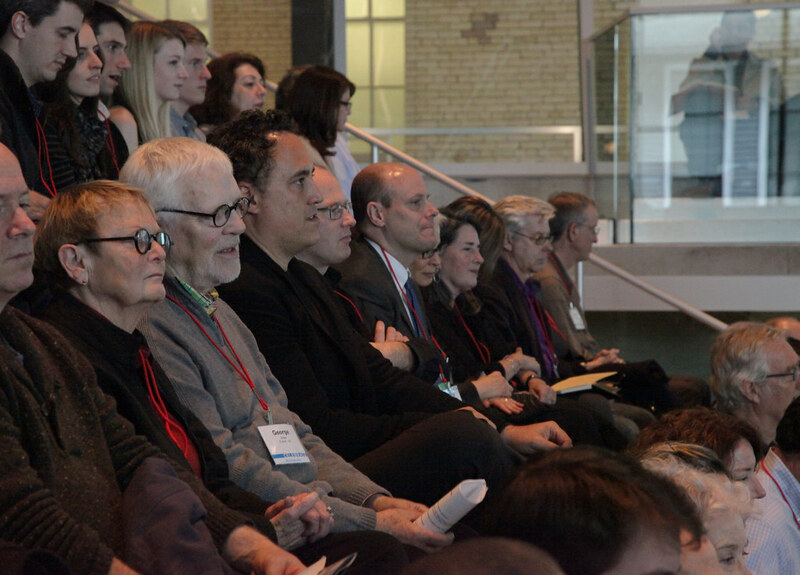 Seated from left to right, Peter Niessen of Inside Outside and Ziad Shehab of OMA. 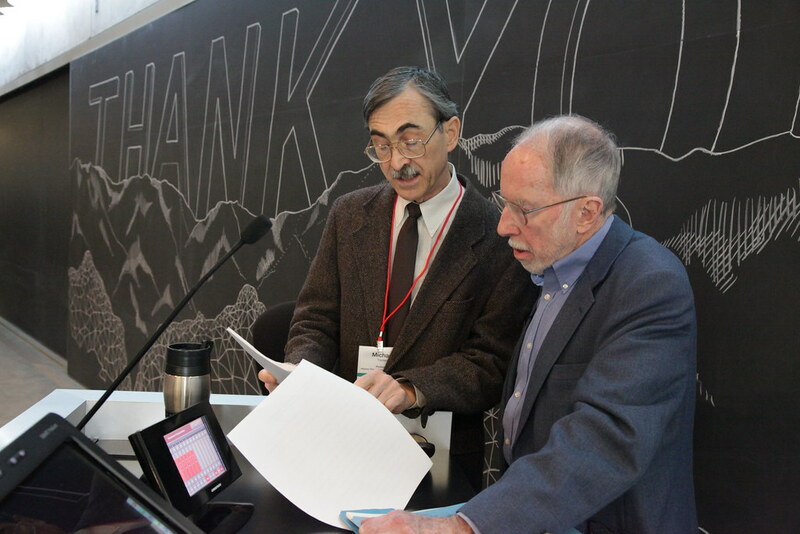 Standing from left to right are Robert Silman of Silman Associates with Shohei Shigematsu of OMA. Kent Kleinman, AAP dean, with Lord Peter Palumbo in the Abby and Howard Milstein Auditorium. 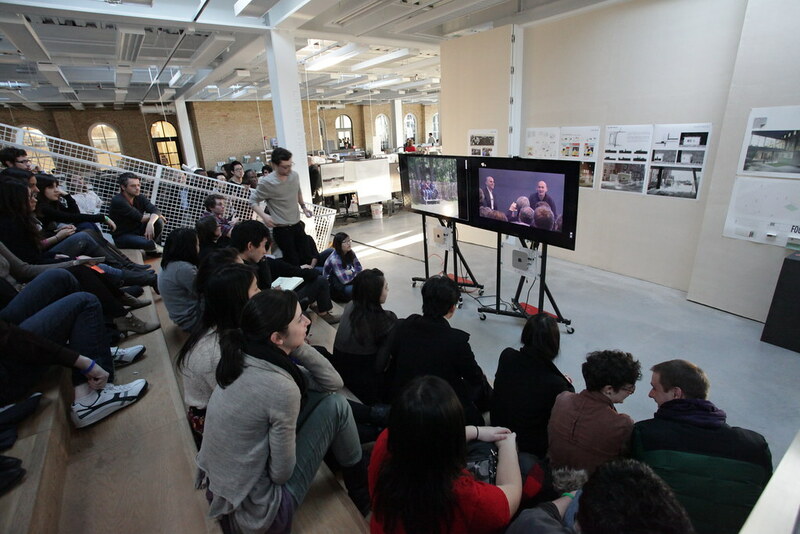 Shohei Shigematsu of OMA during the Making of Milstein Hall presentation of which he was one of the presenters. Students, faculty and alumni at the Making Milstein Hall presentation in the Abby and Howard Milstein auditorium. Alumnus James Bieber at the Making Milstein Hall presentation. 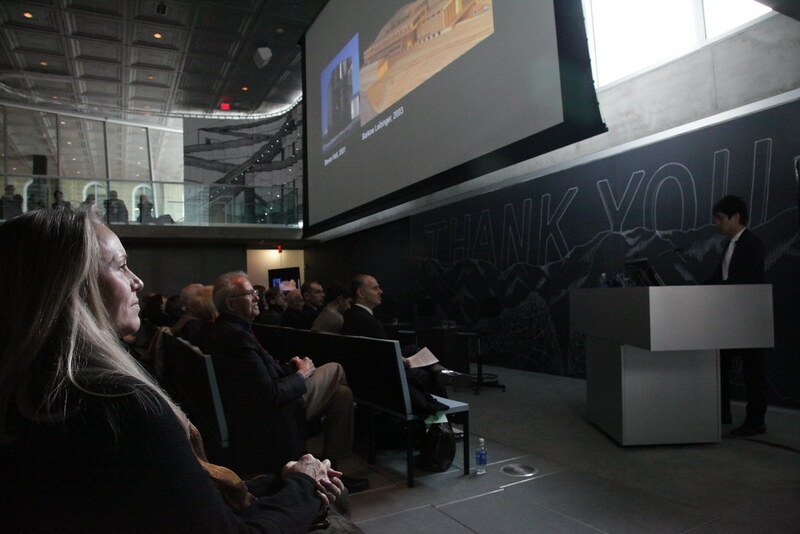 Shohei Shigematsu speaking during the Making of Milstein Hall presentation. The auditorium is filled to capacity with students and alumni during the Making of Milstein Hall presentation. 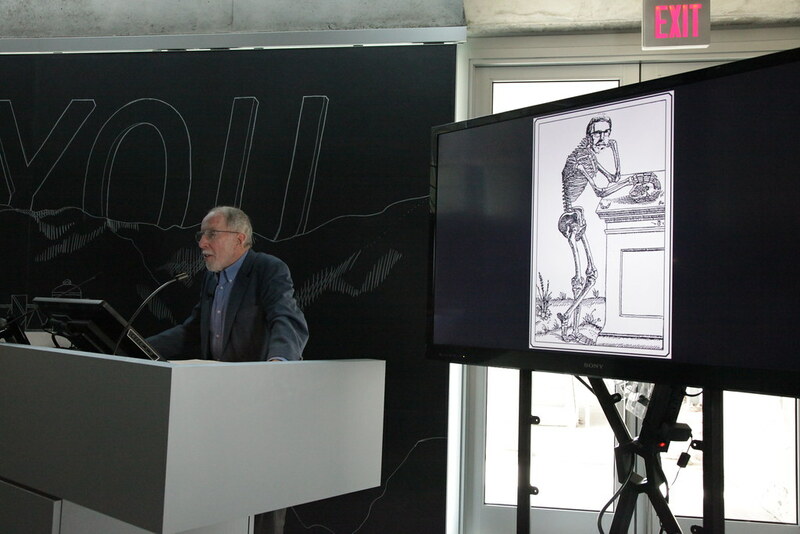 Milstein Hall chief engineer Robert Silman during the Making of Milstein Hall presentation. 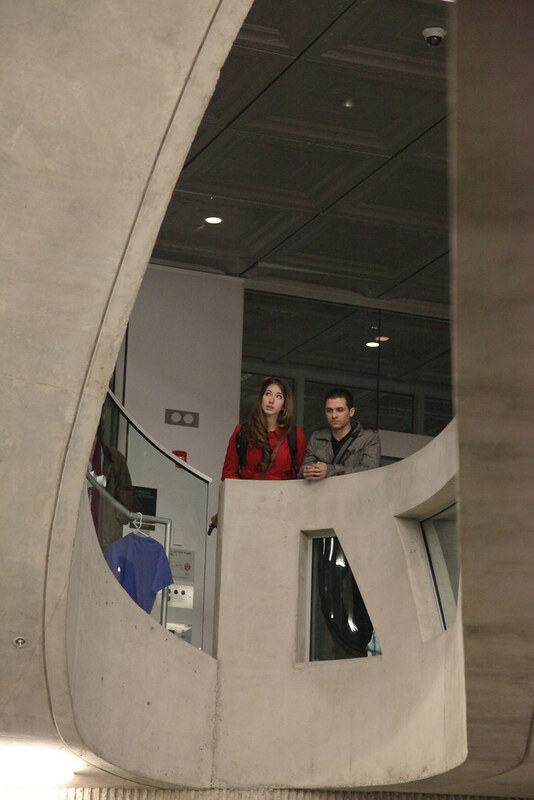 Students and alumni look on from the balcony on the south edge of the Abby and Howard Milstein Auditorium. City and Regional Planning faculty members Michael Tomlan and John Reps preparing for the Reps lecture titled, America's great Urban Design Mystery and the Four From AAP Who Solved It. Professor Emeritus John Reps presenting his lecture, America's great Urban Design Mystery and the Four From AAP Who Solved It, in the Abby and Howard Milstein Auditorium. Architecture alumni visiting with current students on the Milstein Hall studio plate. Alumni Virginia Green (B.Arch. '84) and N. Scott Johnson (B.Arch. '85) talking with t Juan David Grisales (B.Arch. '14) on the Milstein Hall studio plate. Timothy Murray, professor of English and director of the Society for the Humanities at Cornell, with choreographer and A.D. White Professor at Large William Forsythe, in the Abby and Howard Milstein Auditorium. William Forsythe speaks in the Abby and Howard Milstein Auditorium on Saturday afternoon. The audience responding to choreographer William Forsythe in the Abby and Howard Milstein Auditorium. 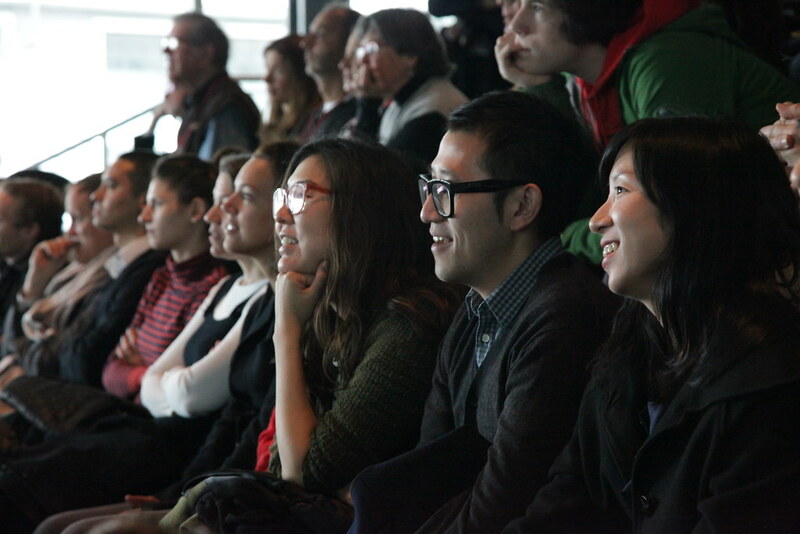 A question from the audience during the conversation with Tim Murray and William Forsythe. 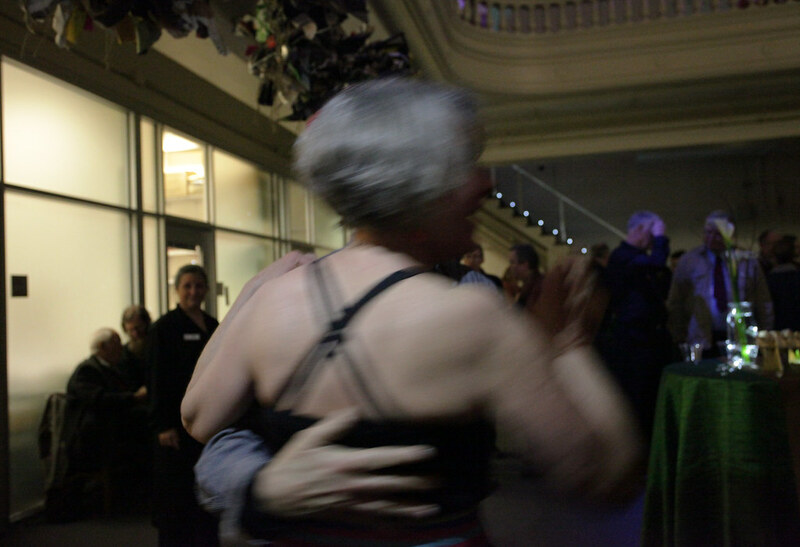 Music and dancing under the Sibley dome on Saturday night. 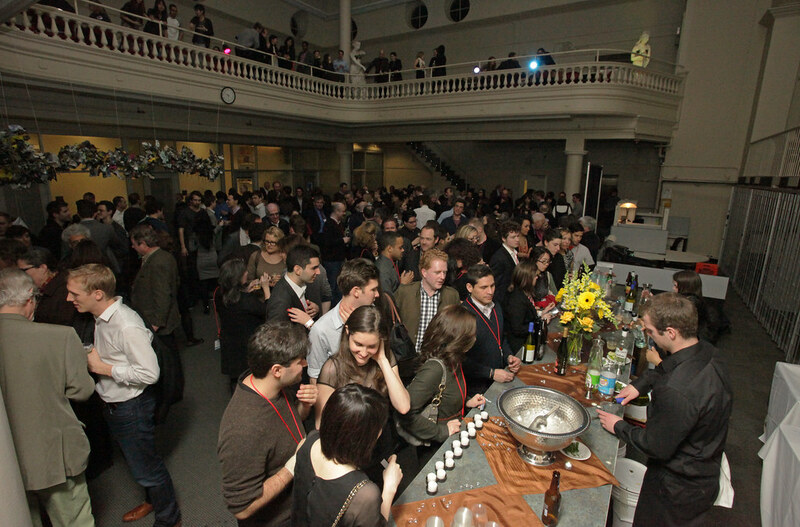 The Sibley Hall dome balcony at the "Party in the Domes" on Saturday night. 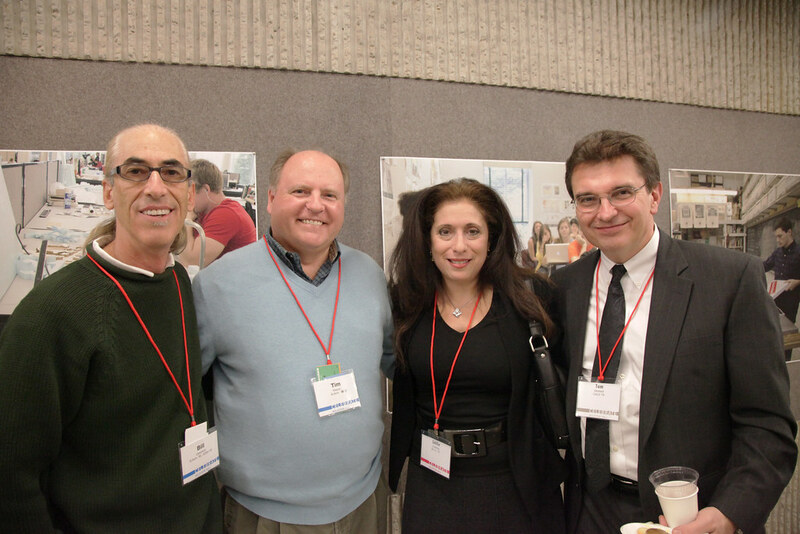 Alumni enjoying the fun under the Sibley Dome on Saturday night. Saturday night party in the Sibley Dome. DJ Dance in Milstein Hall dome during the Party in the Domes on Saturday night. 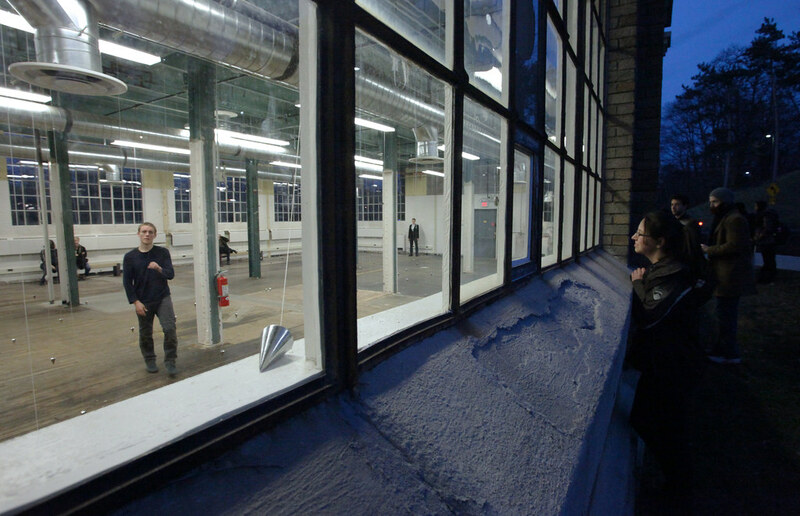 Looking in from the outside of Rand Hall during a performance of Nowhere and Everywhere At The Same Time with Brock Labrenz. 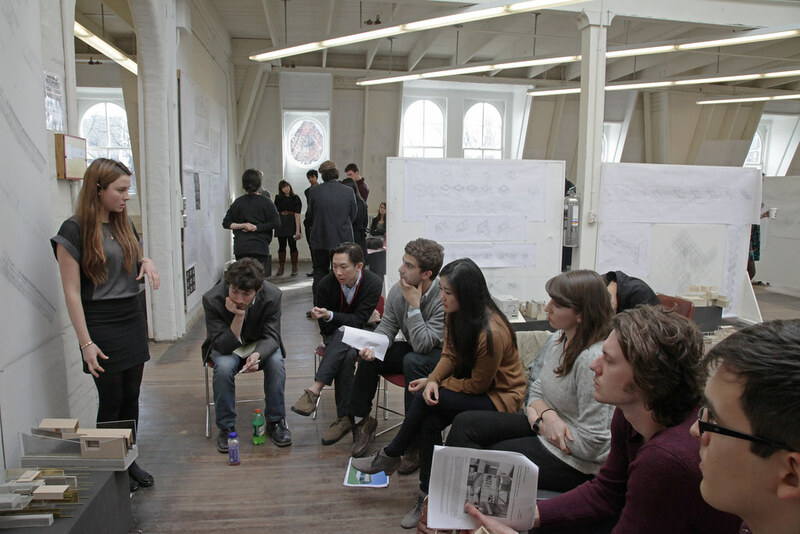 Alumni attend a first-year architecture review on the third floor of Sibley Hall on Friday. 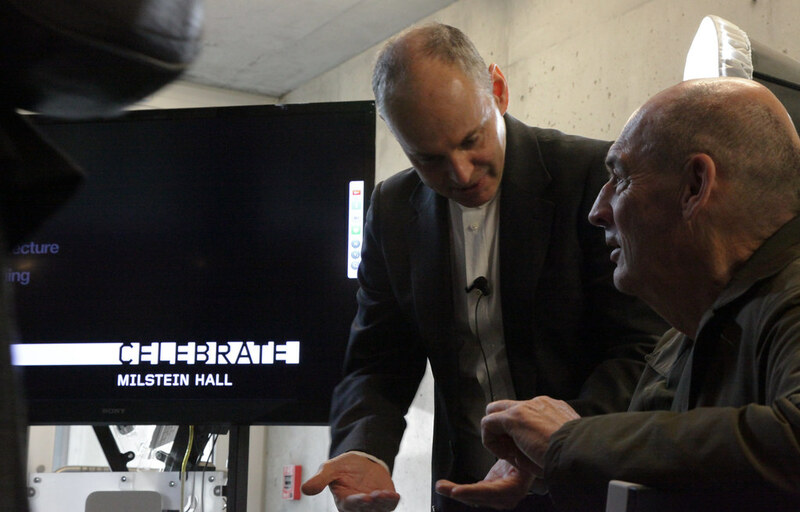 Kent Kleinman, AAP dean, with OMA founding architect Rem Koolhaas in the Abby and Howard Milstein Auditorium. 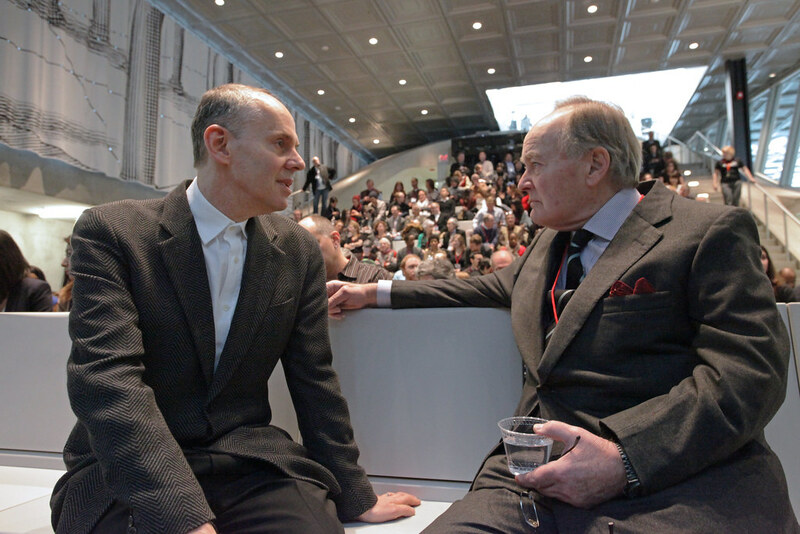 Howard Milstein and guest attend the Rem Koolhaas lecture in the Abby and Howard Milstein Auditorium. 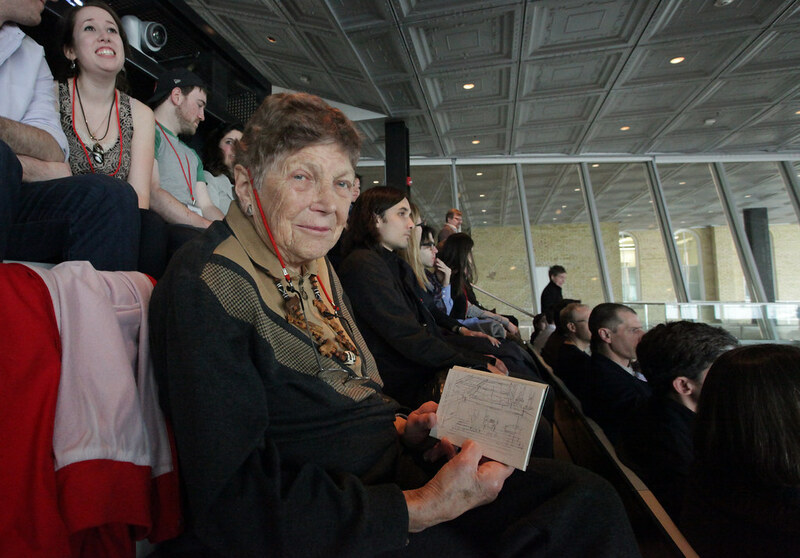 Alumna Frances Shloss (B.Arch. '45) shares her sketch of the auditorium. 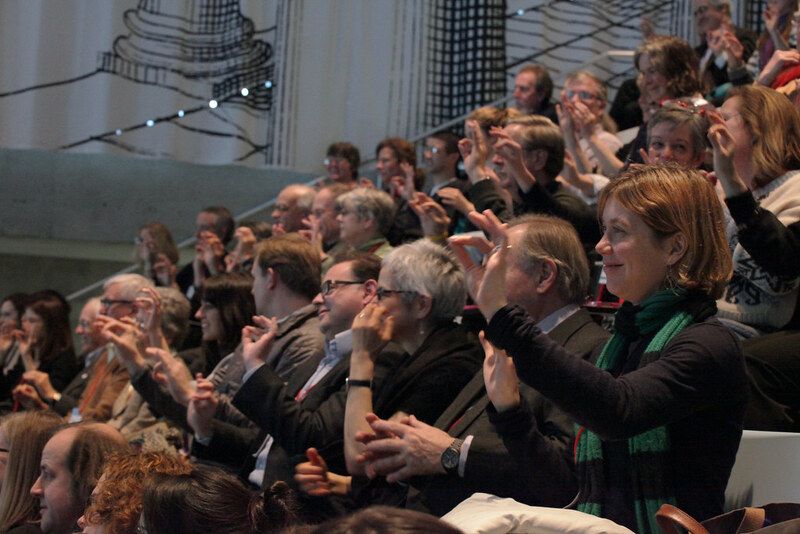 Alumni enjoying the Rem Koolhaas lecture in the Abby and Howard Milstein Auditorium. The view shows the auditorium ceiling and University Avenue cantilever. 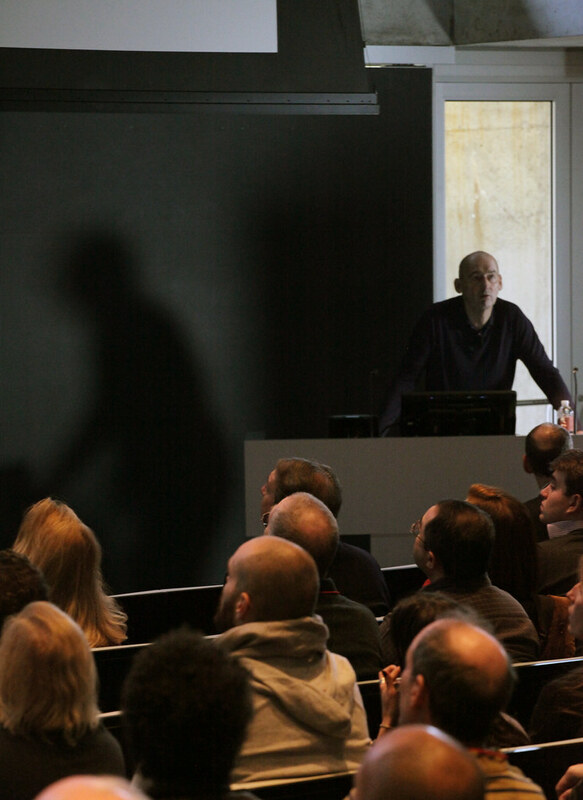 Rem Koolhaas lecturing in the Abby and Howard Milstein Auditorium. 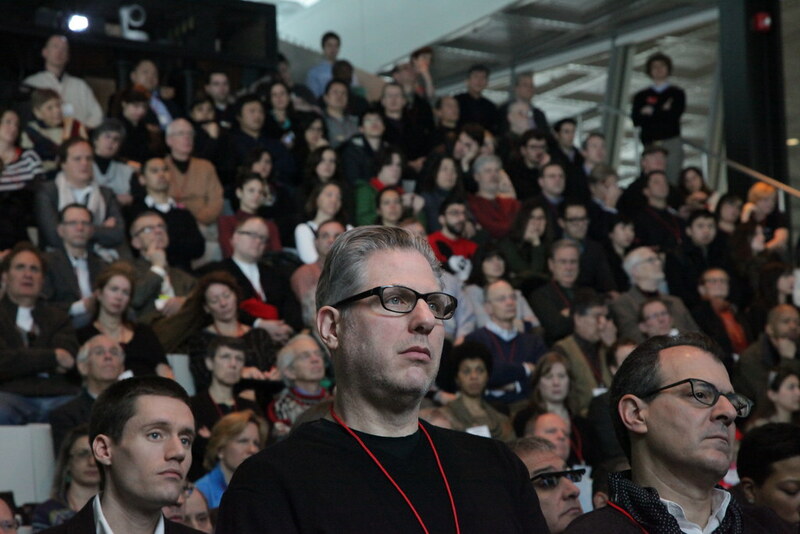 College Alumni and Advisory Council members are part of the capacity crowd at the Rem Koolhaas lecture. 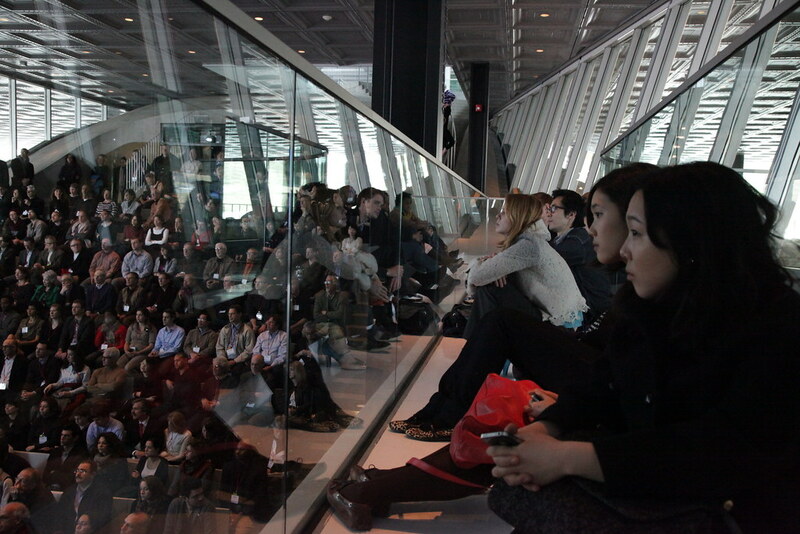 The Stepped Auditorium was used as an additional seating location for students and alumni to watch the Rem Koolhaas lecture. The view from the Abby and Howard Milstein Auditorium balcony showing Dean Kent Kleinman in conversation with Rem Koolhaas. 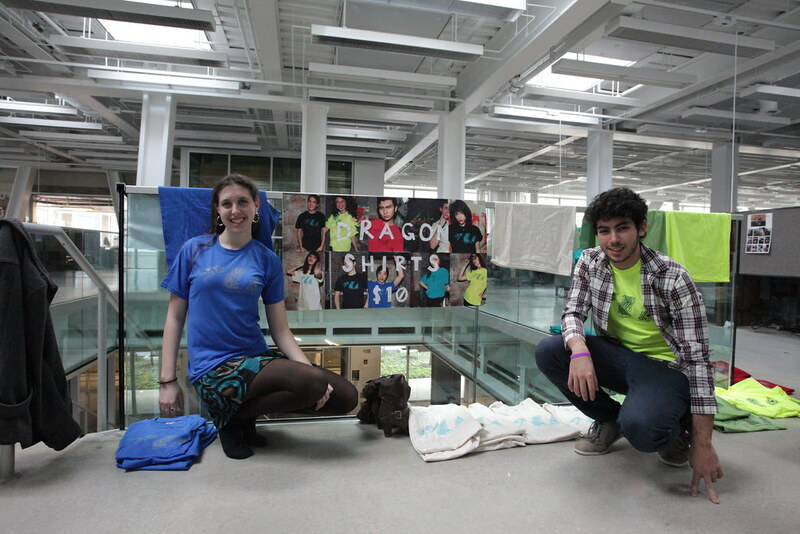 Architecture freshman selling Dragon day t-shirts in Milstein Hall studio. A view of the Friday evening reception from University Avenue eyebrow window. AAP alumna Ellen Bildsten (B.Arch. 88') on the far right, with daughters Mariel and Kate. Ellen's father and architecture alumnus Earnest Pospischil and his wife Maria. View of the Milstein Hall bridge from University Avenue. 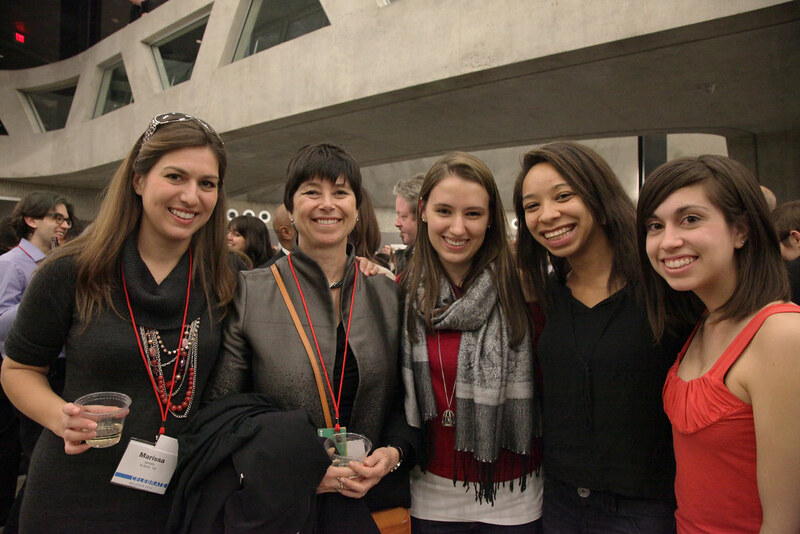 AAP Advisory Council member and alumna Jill Lerner with alumni and students at the Friday evening reception in the Milstein Hall dome. 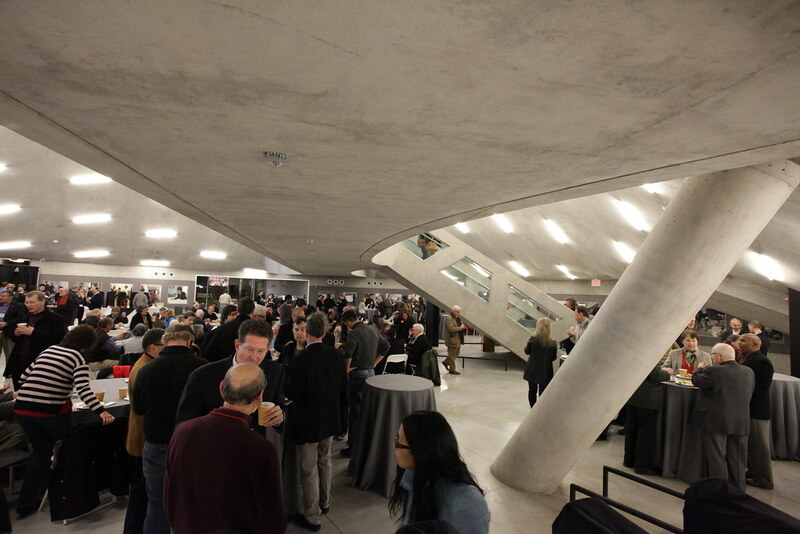 Alumni exploring Milstein Hall during the Friday evening reception. 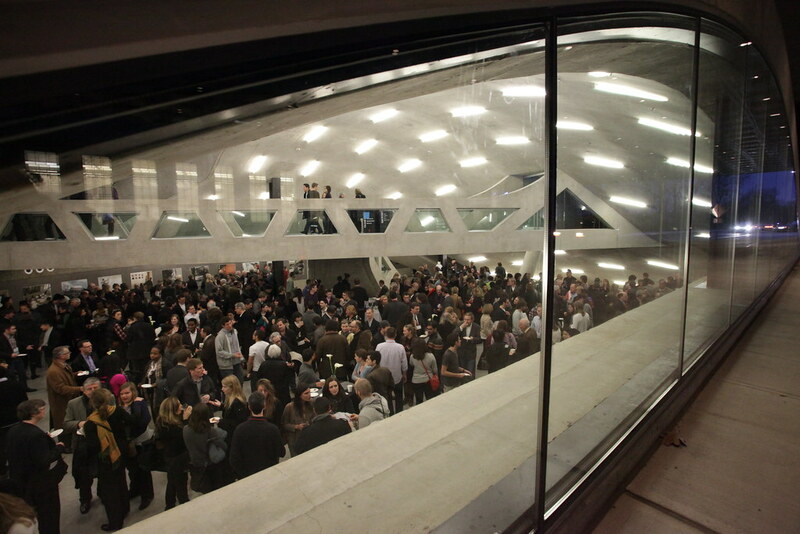 Alumni enjoying the Friday evening reception under the Milstein Hall dome. 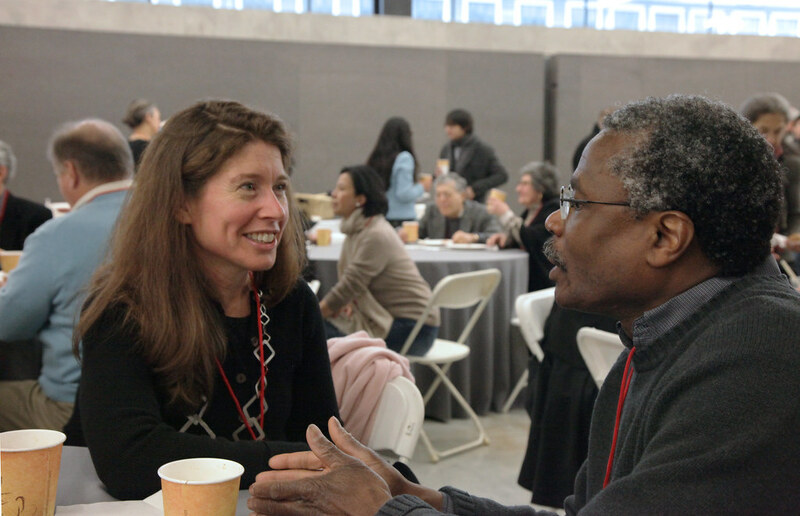 College alumni and faculty enjoy a Saturday morning breakfast with faculty. A view from under the Milstein Hall bridge at the Saturday morning breakfast with faculty. Alumni enjoying the Saturday morning breakfast with faculty. Department of Art faculty member Greg Page talking with an alumna at the faculty breakfast. Seated from left to right, Peter Niessen of Inside Outside and Ziad Shehab of OMA. 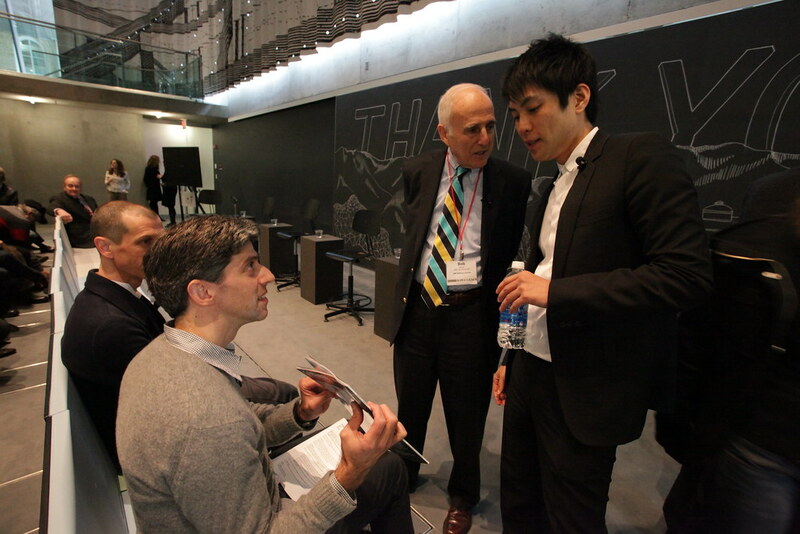 Standing from left to right are Robert Silman of Silman Associates with Shohei Shigematsu of OMA. Kent Kleinman, AAP dean, with Lord Peter Palumbo in the Abby and Howard Milstein Auditorium. 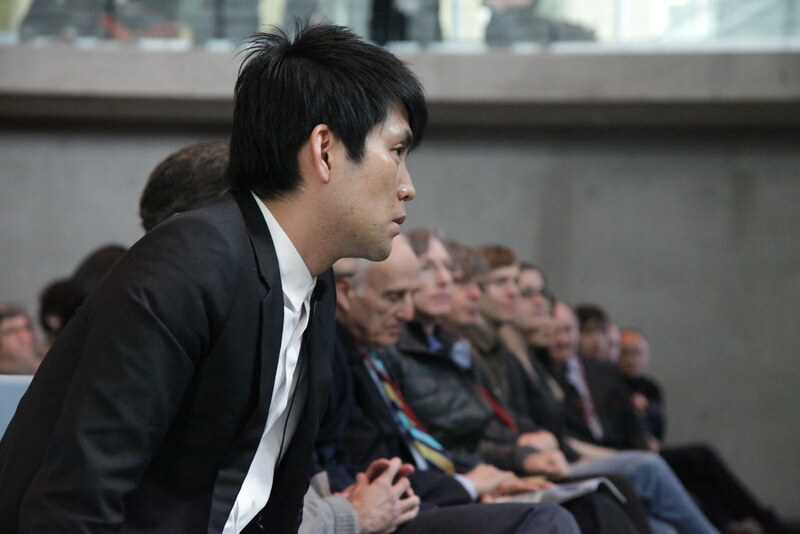 Shohei Shigematsu of OMA during the Making of Milstein Hall presentation of which he was one of the presenters. Students, faculty and alumni at the Making Milstein Hall presentation in the Abby and Howard Milstein auditorium. Alumnus James Bieber at the Making Milstein Hall presentation. Shohei Shigematsu speaking during the Making of Milstein Hall presentation. The auditorium is filled to capacity with students and alumni during the Making of Milstein Hall presentation. 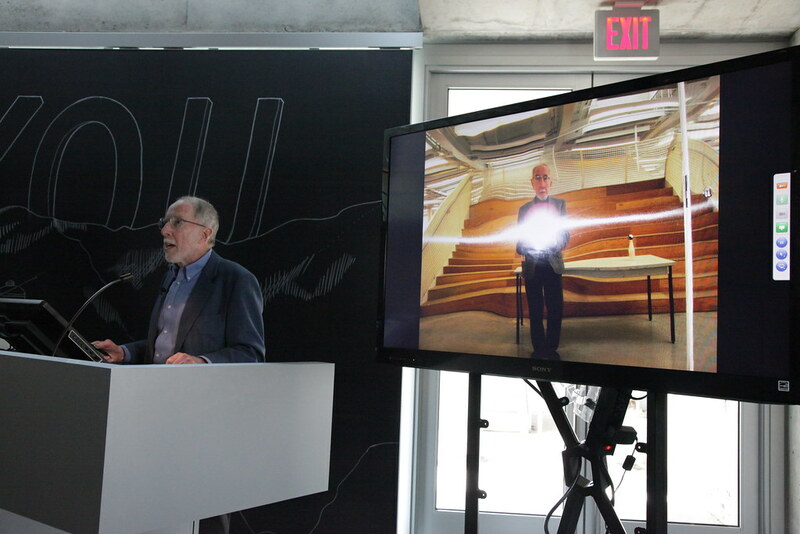 Milstein Hall chief engineer Robert Silman during the Making of Milstein Hall presentation. Students and alumni look on from the balcony on the south edge of the Abby and Howard Milstein Auditorium. City and Regional Planning faculty members Michael Tomlan and John Reps preparing for the Reps lecture titled, America's great Urban Design Mystery and the Four From AAP Who Solved It. Professor Emeritus John Reps presenting his lecture, America's great Urban Design Mystery and the Four From AAP Who Solved It, in the Abby and Howard Milstein Auditorium. 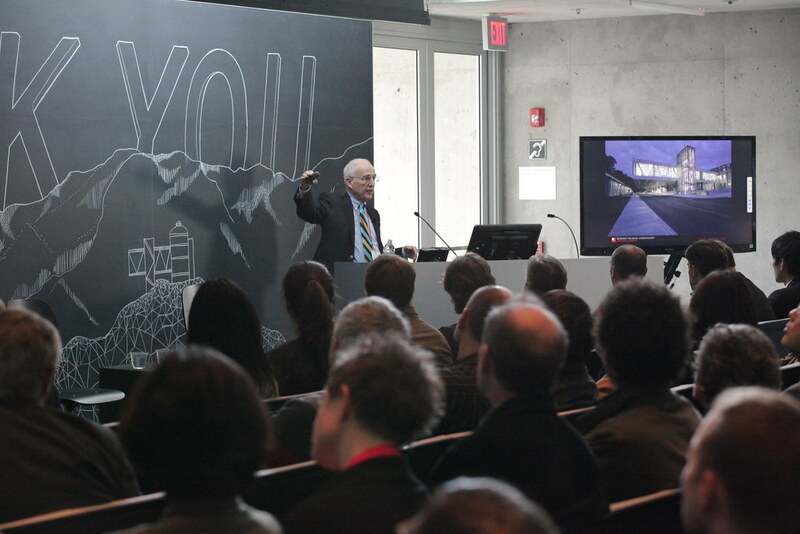 Professor Emeritus John Reps presenting his lecture, America's great Urban Design Mystery and the Four From AAP Who Solved It, in the Abby and Howard Milstein Auditorium. Architecture alumni visiting with current students on the Milstein Hall studio plate. Alumni Virginia Green (B.Arch. '84) and N. Scott Johnson (B.Arch. '85) talking with t Juan David Grisales (B.Arch. '14) on the Milstein Hall studio plate. Timothy Murray, professor of English and director of the Society for the Humanities at Cornell, with choreographer and A.D. White Professor at Large William Forsythe, in the Abby and Howard Milstein Auditorium. 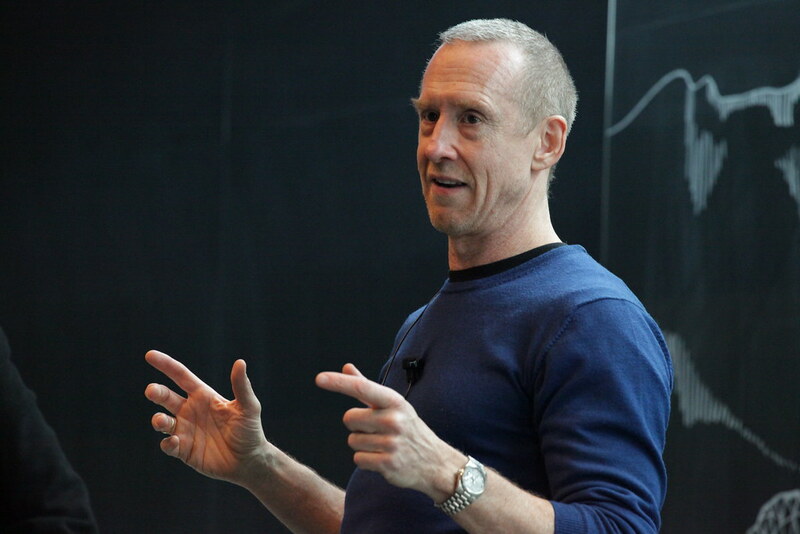 William Forsythe speaks in the Abby and Howard Milstein Auditorium on Saturday afternoon. The audience responding to choreographer William Forsythe in the Abby and Howard Milstein Auditorium. 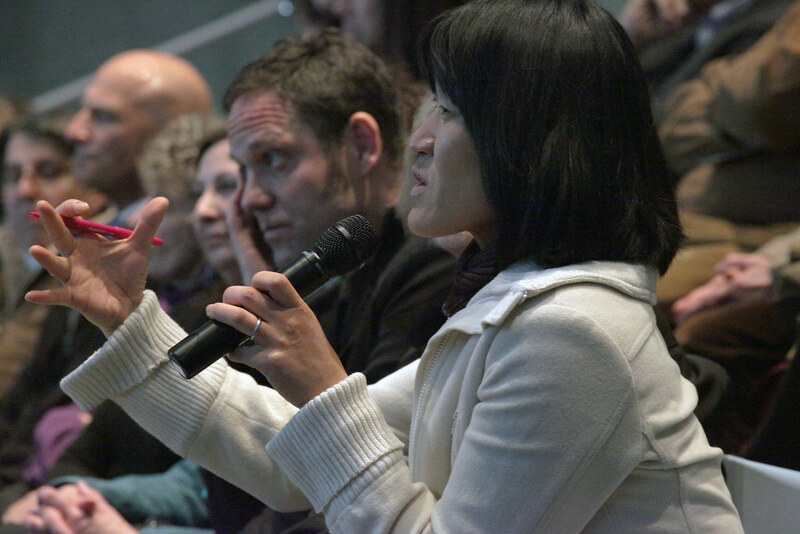 A question from the audience during the conversation with Tim Murray and William Forsythe. Music and dancing under the Sibley dome on Saturday night. The Sibley Hall dome balcony at the "Party in the Domes" on Saturday night. 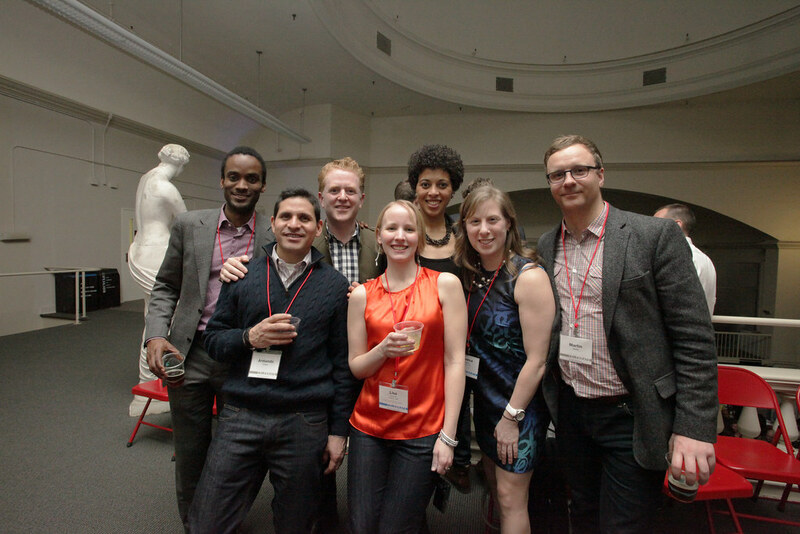 Alumni enjoying the fun under the Sibley Dome on Saturday night. Saturday night party in the Sibley Dome. 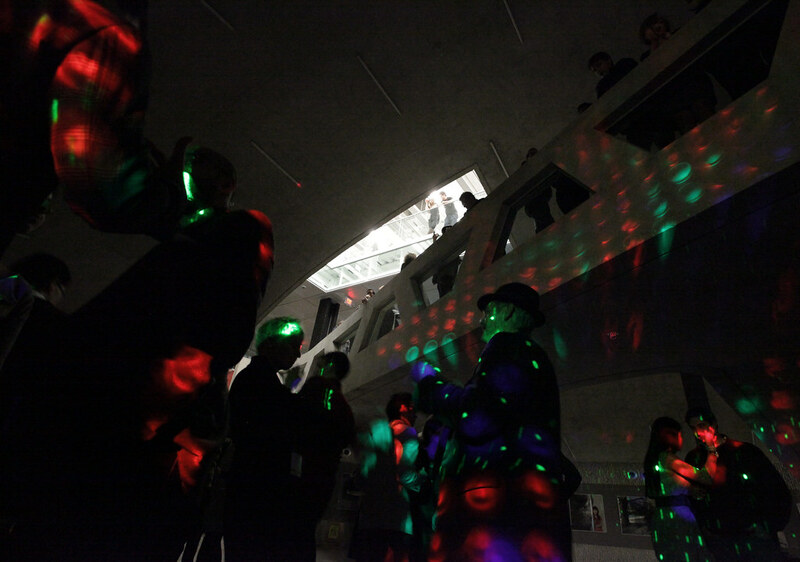 DJ Dance in Milstein Hall dome during the Party in the Domes on Saturday night. Looking in from the outside of Rand Hall during a performance of Nowhere and Everywhere At The Same Time with Brock Labrenz. From lectures by Rem Koolhaas, John Reps (M.R.P. 47), and William Forsythe to an exhibition of work by Simon Ungers (B.Arch. 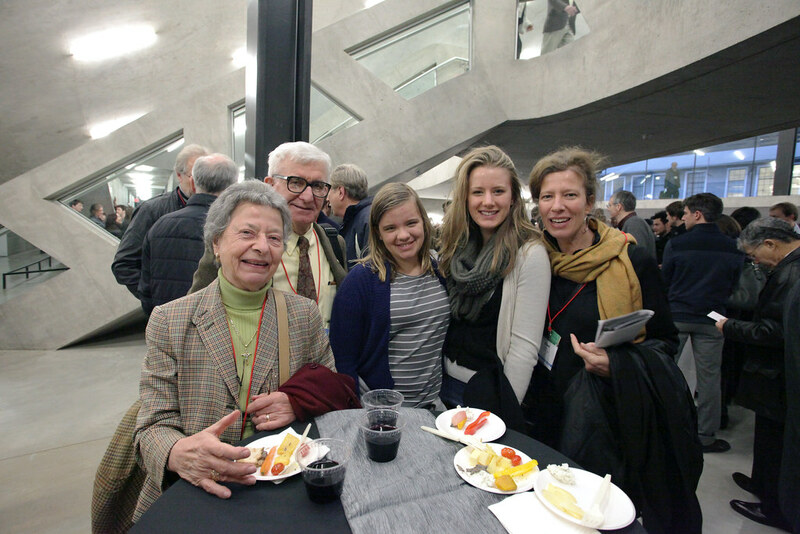 80) to a party unlike any the college has thrown before, Celebrate Milstein Hall energized the AAP community as 500 alumni and guests reconnected with 300 faculty, students, and staff for an exhilarating weekend.